Jonathan Edwards was born in Newport, South Wales and grew up in Crosskeys. He received a BA in English and American Literature and an MA in Writing from the University of Warwick, and now teaches English at a secondary school in Monmouth. Prior to the publication of his first collection his poetry won numerous accolades, including the Terry Hetherington Award in 2010, as well as receiving prizes in the Cardiff International Poetry Competition (for ‘Evel Knievel Jumps Over my Family’) and the Basil Bunting award (for ‘Gregory Peck and Sophia Loren in Crumlin for the Filming of Arabesque, June 1965’) in 2012. His poem ‘Servant Minding a Seat for his Master Before a Performance of The Rivals, Covent Garden Theatre, 1775’ won the 2014 Ledbury Poetry Festival International Competition. 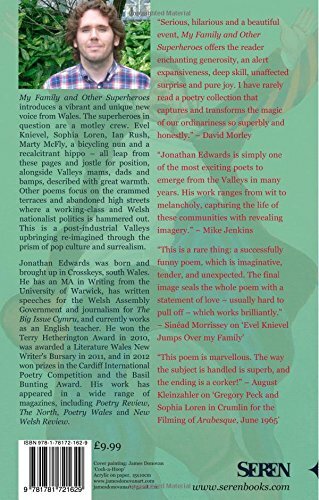 My Family and Other Superheroes, published by Seren in 2014, delivered abundantly on the promise of those individual poems, and has cemented Edwards’s presence in the poetry world as a writer of humorous, idiosyncratic, yet heartfelt and often genuinely moving poems. The collection won the Costa Poetry Award and the Wales Book of the Year People's Choice Award; it was also shortlisted for the Fenton Aldeburgh First Collection Prize. The warm reception of his work makes it tempting to speculate that Edwards might turn out to be the rarest of things: a genuinely popular poet, whose attention to the craft and construction of his poems stands comparison with any supposedly more ‘serious’ poet working today. As evidenced by his poems’ exuberant titles, he possesses an ear for pop culture and a talent for striking, surprising imagery, which often occur together against the unassuming backdrops of ‘everyday life’ – the supermarkets, cafes and airport vistas of 21st century Britain – and make comparisons with poets like Simon Armitage or Billy Collins inevitable and justified. Like them, Edwards discovers strange, memorable and affecting moments among familiar landmarks. Throughout, a keenly felt concern with the histories of family and place grounds his work in a sense of reality that is eminently humane and relatable. Edwards’s readings are enjoyably laconic, reminiscent of the dry humour and comic timing of the well-spun pub anecdote, yet carrying an unexpected weight of expression and feeling. This recording was made for The Poetry Archive on 31 March 2015 at Attic Attack, Bristol, and was produced by Richard Carrington.